Our highly skilled supplier has created a wonderful pairing of good quality organic Sencha and organic toasted brown rice. The taste is rich, mild and never strong or bitter. There is an intriguing and subtle complexity about the flavor of this near perfect blend that is very satisfying. The flavor does not change as it cools. 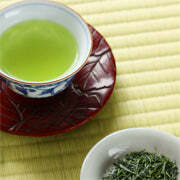 The second steeped liquid is a milder version of the first. 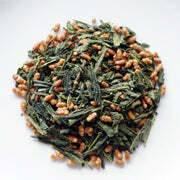 Organic Genmaicha is significantly lower in caffeine than other Japanese green teas so it can be enjoyed into the evening, which makes it a favorite dinnertime beverage in Japan. Organic Genmaicha has been produced according to the strict guidelines of the JAS (Japan Agricultural Standard) and is certified organic.